Love U Bonuses - Dating Coach - Evan Marc Katz | Understand Men. Find Love. Live speaking is one of my favorite things to do, but since it’s not part of my daily business, I don’t get many chances to indulge that part of me. That’s why I’m excited to share this rare footage from Marni Battista’s “Ignite Your Life” event in 2014. Stick around for the full 80 minutes to learn why the dating pool is smaller for smart women, why chemistry hasn’t led you into lasting love, as well as the two best predictors of a happy marriage. is simple: you’re not a man. Therefore, you’ve never fully understood what your ex was thinking when he was dating you. 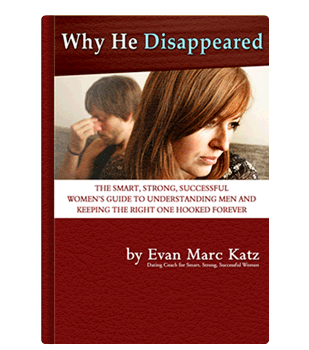 In my bestselling eBook, “Why He Disappeared”, I answer every single one of your lingering questions about men. your dreams, “Why He Disappeared” is a must-read. It can be extremely hard to walk away from a relationship, even when it’s not working. In this FOCUS Coaching call, I’m going to show you why it’s vital to move on when you’re not happy, and, more importantly, HOW to move on. down. Once you learn to establish firm, reasonable boundaries, your relationships will instantly improve. distinguish between a lazy slacker and a financially stable partner who may earn less than you. The first one, you dump. The second, you keep. see that if you have to convince a guy to love you, you don’t want to be with him anyway. Click below to listen, take notes, and supercharge your love life. for over THREE hours. Click below to listen, take notes, and supercharge your love life. Why the Men You Want Aren’t Chasing After You. Why women are typically attracted to the men that never want to commit. The truth of whether instant chemistry is a sign of long-term compatibility or it’s actually fooling you. The reason we often feel uninspired by the men that are good for us. Honestly, you don’t want to miss this, if only to get to the love challenge from me at the end of the call.